Like a cool sea breeze on a hot summer's day, First Word is keepin' things fresh with another dancefloor rocker for the selectors. Our resident jazzy beat maestro Cedar has been hard at work in the studio, orchestrating an EP of broken beat bombs to set floors ablaze. Cedar is the most often used pseudonym for UK producer, Jon Schorah. Influenced by 70's soul-jazz/funk and 80's electronica his tracks blend lush pads and jazzy overtones with finely tuned beats & rhythms. 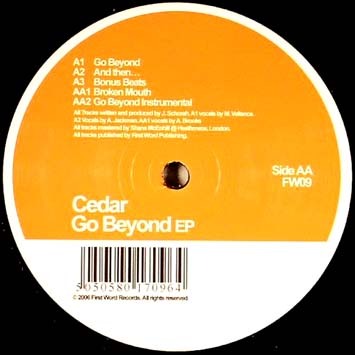 Starting out as a D&B producer, Cedar's early productions were picked up by LTJ Bukem for his Good Lookin' label. Later he released more hip-hop influenced downbeat tracks on the GLR sister-label Cookin' Records. 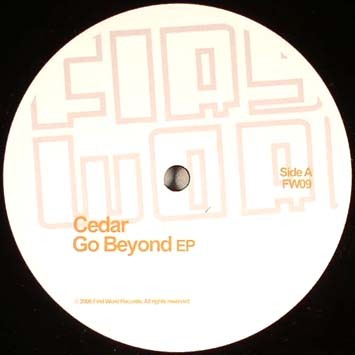 Now producing tunes on a jazzy, broken beat vibe, Cedar has completed remixes for earlier First Word releases, with more reworks in the pipe line, as well as performing in the live manifestation of Today's Mathematics. He's also an accomplished DJ, regularly shaking rumps in clubs across the country. This EP is boiling over with heavy, floor-friendly foot twitchers with shades of Bugz and Amp Fiddler fused with Cedar's own unique sound.